Celebrate National Beer Day on April 7 with these mug-worthy hop-tails. National Beer Day happens to fall during a time of year when we’re all about ready to head outside to the patio and pop open an icy cold one. But why settle for just a bottle or draft of IPA or Hefeweizen? These cocktails make use of brews’ effervescence, refreshment and myriad flavors, from malt and coffee to coriander and citrus. Expand beer lovers’ palates, and maybe even win over the beer-averse, with these 5 sudsy sippers. Brazil’s national sugarcane-based spirit is a perfect match with the wheat-y, fruity notes of a German Hefeweizen, while cardamom bitters coax out its baking spice flavors. Serve these sippers at a patio party alongside chicken Caesar salad or lemon ricotta flatbread. Add the first 4 ingredients to a cocktail shaker, add ice and shake until chilled. Strain it into a tall glass over fresh ice, add beer and garnish with lemon peel. This drink is a little bit Mojito and a little bit Daiquiri, yet unique in its own right. 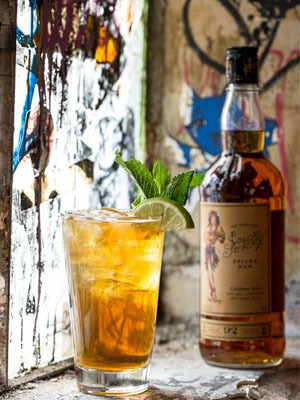 “The cinnamon and nutmeg in Sailor Jerry Spiced Rum offer a balanced and spicy taste with the richness of amber lagers,” says Daniel “Gravy” Thomas, Sailor Jerry brand ambassador. Muddle simple syrup, lime and mint in the bottom of a cocktail glass. Add the rum and ice, and shake well until chilled. 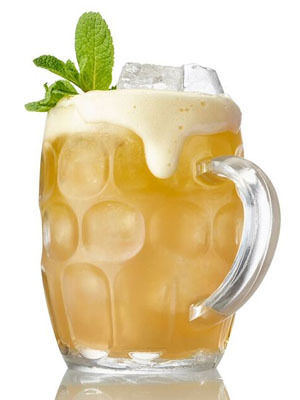 Double strain into a beer mug or pint glass over fresh ice, top with amber lager and garnish with lime and mint. 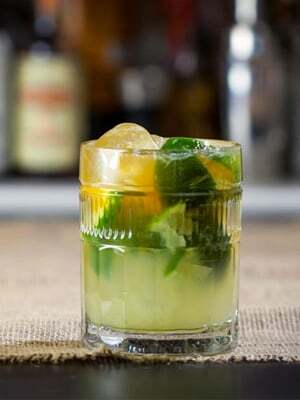 Add the Drambuie, grapefruit juice and mint leaves to a shaker, add ice and shake until chilled. Add beer, stir gently to combine, and strain over fresh ice in a rocks glass. Garnish with a mint sprig. How much easier can a beer cocktail get? All this one needs is cachaça, some citrus, agave nectar (or simple syrup, in a pinch), and a bitter, hoppy IPA. Grier prefers those from the Northwest part of the country in this drink named for the variety of hops that often gives IPAs their irresistible bite. Add the first 3 ingredients to a cocktail shaker, add ice and shake until chilled. Strain into a glass over fresh ice, and float with a Northwest IPA. Light and lively is the way to describe this libation from the Celtic-themed sports bar chain. It gets a hearty dose of citrus from orange liqueur, lemon juice and a squirt of lemon wedge, all mixed with easy-to-drink Blue Moon. Add the first 3 ingredients to a cocktail shaker, add ice and shake until chilled. 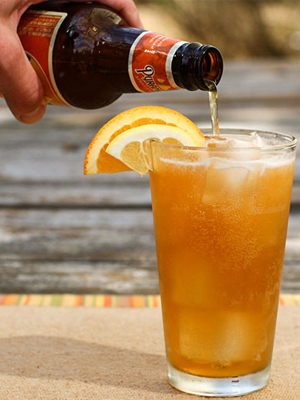 Strain into a glass, top with the Blue Moon and garnish with a lemon wedge. Chill the beer. While you may think that shaking the other ingredients with ice is enough to get the drink cold, topping it off with a room temperature or barely cold brew will warm down the whole tipple. Don’t shake the beer. Adding a brew to the cocktail glass and shaking wildly will make it lose its effervescence, which is part of what makes a beer-tail so refreshing to sip. Think about the style of beer. Wheat beers and hefeweizen mix well with citrus; hops pair with bitter and aromatic elements; and stouts and other dark beers can stand up to full-flavored ingredients. Mix up the glassware. Think about using large wine goblets, Moscow Mule mugs and hurricane glasses instead of always reaching for pint glasses or traditional beer mugs. These are cocktails, after all.